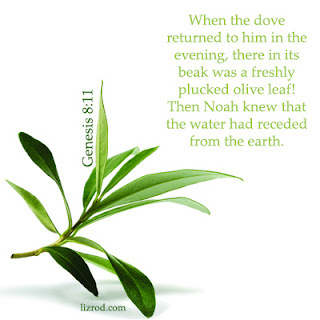 "When the dove returned to him in the evening, there in its beak was a freshly plucked olive leaf! Turmoil and life’s difficulties can leave the soul with unrest. We wonder if restoration will arrive. We debate ourselves and find that sin is at the root of the troubles in this world. We’ve entertain it. We adjust and make sin comfortable. We twist the Word of God to make it what we want it to say. Our justification leads us down a road of trouble. But, Noah was a man who was found righteous in the eyes of God. He heard God’s direction and though it seemed ridiculous he followed through. He believed God. In this fallen world sometimes, we are the dreamer with interruptions assailing at us. The vision was given but the realities seem to escape us. So many days and weeks in the flooded waters. I know I heard God. As he waits and waits I wonder did his heart grow weary or stronger? When we wait on the Lord, do we grow tired or does our faith increase? The preservation of the seed is remarkable! Turmoil, flooding, shifting and the conditions of the earth God made were shaken. But the seed survived, preserved! Noah did not plant the seed. The dove came to him with an olive leaf. Extraordinary event! When life has been shaken like a world-wind tornado, where is the hope? The hope does not depend on me. The hope comes from God. I am to rely on HIM! So, like the dove sent out by Noah, I pour out my heart to the Lord. I wait on the One who preserves the seed! God who created everything along with the Son and the Spirit hears, sees and preserves. The Initiator of the vision is the one who makes it come to pass. Don’t give up even though the waters are rising! Don’t loose the vision because it was the Lord who spoke it! Watch and pray! It is coming. Remain faithful for God is the Promise Keeper! When babies are born their eyes don't have the ability to fully focus. Their eyes are developing. They sewed figs leaves together to hide what their eyes were seeing. Where once there was no shame, their new gained sight brought some new visitors; more like enemies! Shame had now made itself at home. Disobedience lead to death. When God opens our eyes the dead come to life. 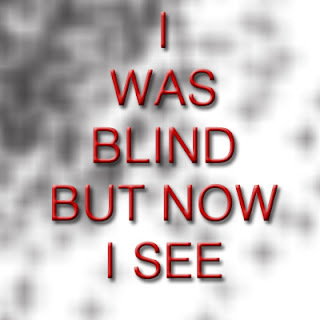 We are born again and able to readjust our sight to see life and interrupt life through a new set of "lenses". Our relationship with the Father is restored. Eternity becomes a focal point. A submitted vessel surrenders all to the Lord. He has all we need to live, he makes provision and leads us to overcome evil. In the story of Elisha we see trouble surrounding Israel. The king of Aram had encircled Elisha and his servant. When we wait on God he is able to "open our eyes" to see the unseen. The serpent promised Eve that she could be like God and what was delivered was death. God desires obedience and He delivers life. “And Elisha prayed, “Open his eyes, Lord, so that he may see.” Then the Lord opened the servant’s eyes, and he looked and saw the hills full of horses and chariots of fire all around Elisha." If you are unfamiliar with the story of Elisha. Here we see Elisha, a prophet, but a man none the less. This is not a superhero. This is one called by God and he obeyed! In the middle of this war, God opened his eyes to see in the spiritual realm what God was doing. Obedience always leads to life! When the serpent deceived Eve he showed her a peek into the spiritual realm. Death was waiting and indeed greeted her and Adam just as the Lord had spoken. In addition, their authority to rule over all God had created was now up for grabs. When the Lord intervenes in the lives of men and we obey he delivers the truth. We get a front row seat of what is happening. He gives us understanding and wisdom. The vision assured them of the unseen realities all around them. So what do we want? Should our eyes be opened prematurely? Should we listen to the lures of the devil who is aware of the spiritual realm but wants us dead? It is wise to seek the Lord who can open our eyes to life! There is something happening in the unseen. For the believer, God goes before us. He speaks and reveals to us his plan, is provision and protection as in the testimony of Elisha. The coats of skin, a foreshadow of the cost it would take to cover the sins of the world. Blood was required. Someone had to die. Disobedience has an effect and an action that is required. Someone sins – Someone has to die. The law required blood. Christ offered himself –the Lamb of God to bring restoration and right relationship with us and himself. Obedience…sometimes is seems difficult but really to do otherwise brings destruction.